The Brazilian new passenger car market’s impressive recent run ran out of steam last month as it came in flat although Fiat Chrysler Automóveis comfortably beat the market to rise 7.9% year-on-year to 24,901 units. However, that positive direction was down to the Jeep division while the Fiat brand dipped into negative territory. The Brazilian new passenger car market’s impressive recent run ran out of steam last month as it came in flat although Fiat Chrysler Automóveis (FCA) comfortably beat the market to rise 7.9% year-on-year to 24,901 units. However, that positive direction was down to the Jeep division while the Fiat brand dipped into negative territory. That positioned FCA as the second best-selling passenger carmaking group on the market for May, some way behind usual market leader GM (28,307 units) but almost a thousand units clear of third placed VW (23,944 units). Meanwhile, Hyundai (14,866 units) and Ford (16,862 units) were the fourth and fifth volume passenger car sellers in Brazil for the month just gone. In total 164,306 new passenger cars were sold in Brazil last month, up 0.6% year-on-year. FCA’s sales during May were split between the Fiat brand, which was down 4.8% to 14,869 units, and Jeep, which rose 34.9% to 10,001 units. For the year-to date 794,522 new passenger cars have been sold in Brazil which is up more than one hundred thousand units and 15.7% on the same five-month period last year. The Fiat brand is on 66,421 units sold so far this year and is up 5.6% year-on-year while Jeep rests on 41,037 units and is up 22.5%. Meanwhile, in the Light Commercial Vehicle (LCV) segment 30,743 units were sold during May, a rise of 14.3% year-on-year and the Fiat brand matched the market as it was up 14.7% to 11,831 units to dominate the segment with more than a third of all sales. FCA’s closest rival in the LCV sector was VW which totted up 5,675 sales last month albeit to weigh in at less than half Fiat’s volumes. 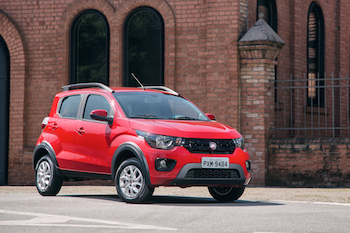 For the year-to-date the Brazilian LCV segment is on 138,224 sales and up 19.1% while Fiat has 52,528 sales and closely mirrors the overall market’s direction as it’s up 19% on the opening five months of last year.